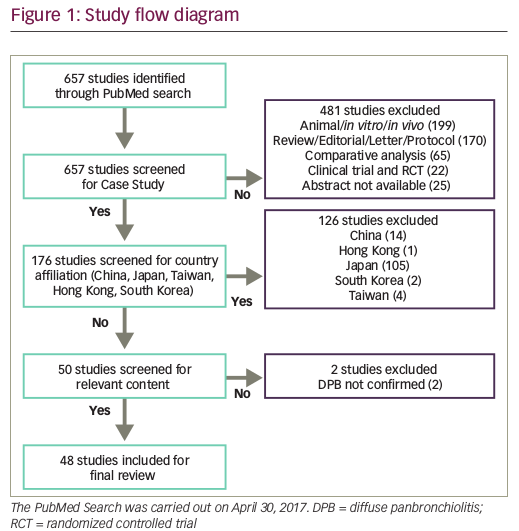 Diffuse panbronchiolitis (DPB) is a rare inflammatory lung disease, and is well recognized in East Asian countries like Japan, China, Taiwan and Korea. Over the years, sporadic DPB cases have been reported worldwide from other countries. This literature review presents an overview of 48 DPB cases from other regions of the world including the US, European countries and Australia. Identification of DPB cases from different racial groups across the globe indicates toward a need to educate pulmonologists to correctly diagnose and initiate treatment. Ram Kumar Mishra has nothing to declare in relation to this article. Opinions expressed in this article are the author’s own findings and do not in any manner reflect or represent the view of the organization to which he is affiliated. Diffuse panbronchiolitis (DPB) is a rare inflammatory lung disease. It was first identified in 1969 and is well recognized in East Asian countries such as Japan, China, Taiwan, and Korea.1 ‘Diffuse’ and ‘pan’ words in the name indicate ‘presence of lesions through both the lungs,’ and inflammation in all layers of bronchioles. At the time of its discovery, DPB had poor prognosis because of recurrent respiratory infections leading to respiratory failure. In the years following the initial description of DPB in Japan, cases were also identified in other parts of Asia including China and Taiwan, thus giving it recognition as a distinct clinical entity. Over the years, sporadic DPB cases have been reported worldwide in countries other than Japan, China, Taiwan, and Korea (hereafter referred to as rest of the world [ROW]). This stimulated us to undertake a comprehensive search for available case studies on DPB. The aim of this study was to present the current clinical evidence captured as DPB case studies across the globe excluding East Asian countries. A total of 657 studies regarding DPB were retrieved from PubMed in a systematic manner (Figure 1). Forty-eight case studies published in ROW and indexed in PubMed were included in the final review. In the past, some publications had attributed lack of clinical awareness and diagnostic familiarity in ROW countries with under-diagnosis and failure of treatment of DPB.8 It was demonstrated that East Asians have more chance to possess the human leukocyte antigen (HLA) serotype—Bw54, which was demonstrated to be associated with DPB.50 In the present study, HLA-Bw54 serotype testing was carried out in 8 cases (16.7%), whereas high-resolution computed tomography (HRCT) was reported in 21 cases (43.8%). Other methods such as chest radiography (X-ray) or computed tomography (CT) were popularly utilized in different studies for clinical decision-making. Apart from these, 25 of 48 studies (52.1%) relied on histopathological investigations (surgical, bronchoscopy, open lung or trans-bronchial biopsy etc.) to confirm the diagnosis of DPB. The fact that there were a total of 13 DPB cases from six countries nearby to East Asia (Australia, 5 studies; New Zealand, 1; India, 3; Thailand, 2; Singapore, 1; and Malaysia, 1 study) raises concerns. Since DPB treatment and prognosis are different from other obstructive pulmonary diseases, the chances of misdiagnosis are high. Early diagnosis, identification and early initiation of low-dose macrolide therapy can lead to improved survival. Patients with DPB described from ROW countries may also increase if this disease is taken into consideration in differential diagnosis of sinopulmonary diseases. Differential diagnoses of DPB include chronic bronchitis, bronchiectasis, primary ciliary dyskinesia, cystic fibrosis, hypogammaglobulinaemia, and bronchiolitis.51 Diagnostic criteria proposed in 1998 by a working group of the Ministry of Health and Welfare of Japan52 include: (a) persistent cough, sputum, and exertional dyspnea; (b) history of chronic paranasal sinusitis; (c) bilateral diffuse small nodular shadows on a plain chest X-ray (CXR) film or centrilobular micronodules on chest computed tomography (CT) images; (d) coarse crackles; (e) ratio of forced expiratory volume (FEV1) and forced vital capacity (FVC) <70%, arterial oxygen tension (PaO2) <80 mmHg; and (f) titer of cold hemagglutinin ≥64. Established DPB cases should fulfill criteria a, b, and c, along with at least two of criteria d, e, and f.
Established diagnostic criteria and treatment guidelines are well known in East Asian countries where the disease incidence is higher. But, as is evident from case studies in this article, the emerging global footprint of this disease raises concerns. There is a need to make clinicians aware and familiar with DPB, and to recognize it as global sinobronchial disease by discussing its diagnostic features to help pulmonologists able to recognize and treat this disease without delay. The observation that the majority of DPB case studies were identified in developed countries (US, Italy, France, and Australia [Figure 2]) can be attributed to increasing awareness amongst pulmonologists. To conclude, the effects of DPB under-reporting due to lack of awareness and recognition leading to misdiagnosis and delayed (or lack of) treatment, cannot be ignored. Though sporadic cases from other geographical regions have been reported in past, the chances of DPB being misdiagnosed cannot be ignored. Timely diagnosis and intervention initiation can be life saving for many potential patients who might have been misdiagnosed. Homma H, Yamanaka A, Tanimoto S, et al., Diffuse panbronchiolitis: a disease of the transitional zone of the lung, Chest, 1983;83:63–9. Desai SJ, Gephardt GN, Stoller JK, Diffuse panbronchiolitis preceding ulcerative colitis, Chest, 1989;95:1342–4. Randhawa P, Hoagland MH, Yousem SA, Diffuse panbronchiolitis in North America. Report of three cases and review of the literature, Am J Surg Pathol, 1991;15:43–7. Baz MA, Kussin PS, Van Trigt P, et al., Recurrence of diffuse panbronchiolitis after lung transplantation, Am J Respir Crit Care Med, 1995;151:895–8. Homer RJ, Khoo L, Smith GJ, Diffuse panbronchiolitis in a Hispanic man with travel history to Japan, Chest, 1995;107:1176–8. Fitzgerald JE, King TE Jr, Lynch DA, et al., Diffuse panbronchiolitis in the United States, Am J Respir Crit Care Med, 1996;154:497–503. Fisher MS Jr, Rush WL, Rosado-de-Christenson ML, et al., Diffuse panbronchiolitis: histologic diagnosis in unsuspected cases involving North American residents of Asian descent, Arch Pathol Lab Med, 1998;122:156–60. 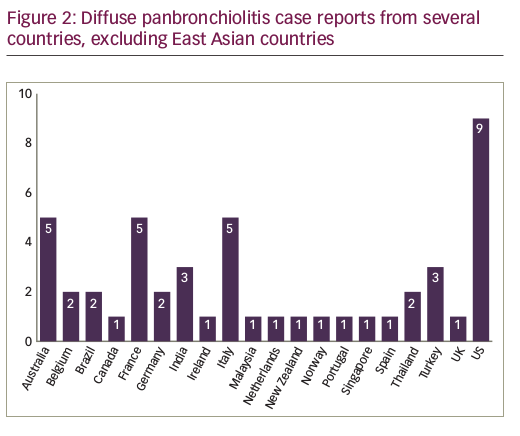 Krishnan P, Thachil R, Gillego V, Diffuse panbronchiolitis: a treatable sinobronchial disease in need of recognition in the United States, Chest, 2002;121:659–61. Boroumand N, Cooke R, Prys-Picard C, et al., Idiopathic bronchiolitis with features of diffuse panbronchiolitis in an African-American patient with hepatitis C virus infection, Ann Diagn Pathol, 2010;14:443–6. Weinberger M, Fischer A, Kao S, Diffuse panbronchiolitis in a 10-year-old boy, Pediatr Pulmonol, 2015;50:E32–4. Ng P, Dwyer R, Despas P, Diffuse panbronchiolitis: case report and review of the literature, Australas Radiol, 1998;42:146–50. Claxton S, Markos J, A case of diffuse panbronchiolitis, Aust N Z J Med, 2000;30:99–100. Anthony M, Singham S, Soans B, Tyler G, Diffuse panbronchiolitis: not just an Asian disease: Australian case series and review of the literature, Biomed Imaging Interv J, 2009;5:e19. Brown J, Simpson G, Diffuse panbronchiolitis in an Australian aborigine, Respirol Case Rep, 2014;2:64–6. Gibson J, King H, Singh M, Tran K, Diffuse panbronchiolitis in a Samoan man, Respirol Case Rep, 2017;5:e00217. Tredaniel J, Zalcman G, Gerber F, et al., Diffuse panbronchiolitis: efficacy of low-dose erythromycin, Respir Med, 1993;87:229–30. Trédaniel J, Cazals-Hatem D, Zalcman G, et al., Diffuse panbronchiolitis: efficacy of low-dose erythromycin, Respir Med, 1994;88:479–80. Brugiere O, Milleron B, Antoine M, et al., Diffuse panbronchiolitis in an Asian immigrant, Thorax, 1996;51:1065–7. Courbot A, Chabot F, Jankowski R, et al., [Sinobronchial syndrome], Rev Mal Respir, 2001;18:193–6. Tossier C, Pilette C, Guilleminault L, et al., Diffuse panbronchiolitis and IgA nephropathy, Am J Respir Crit Care Med, 2014;189:106–9. Poletti V, Patelli M, Poletti G, et al., Diffuse panbronchiolitis observed in an Italian, Chest, 1990;98:515–6. Poletti V, Patelli M, Poletti G, et al., Diffuse panbronchiolitis observed in an Italian male, Sarcoidosis, 1992;9:67–9. Zompatori M, Poletti V, Diffuse panbronchiolitis. An Italian experience, Radiol Med, 1997;94:680–2. Trisolini R, Cancellieri A, Paioli D, et al., Sarcoidosis in the setting of idiopathic chronic bronchiolitis with airway colonization from P. aeruginosa: treatment with low-dose macrolides, Intern Med, 2008;47:537–42. Ginori A, Barone A, Bennett D, et al., Diffuse panbronchiolitis in a patient with common variable immunodeficiency: a casual association or a pathogenetic correlation?, Diagn Pathol, 2014;9:12. Jadhav S, Joshi JM, Diffuse panbronchiolitis associated with malignant thymoma, Indian J Chest Dis Allied Sci, 2010;52:41–2. Nath A, Aggarwal AN, Gupta R, Diffuse panbronchiolitis: report of a rare disease from India, Indian J Chest Dis Allied Sci, 2010;52:43–5. Tirpude S, Karkhanis V, Joshi JM, A potentially misdiagnosed suppurative and obstructive airway disease, J Postgrad Med, 2012;58:302–4. Gulhan M, Erturk A, Kurt B, et al., Diffuse panbronchiolitis observed in a white man in Turkey, Sarcoidosis Vasc Diffuse Lung Dis, 2000;17:292–6. Aslan AT, Ozcelik U, Talim B, et al., Childhood diffuse panbronchiolitis: a case report, Pediatr Pulmonol, 2005;40:354–7. Atici AG, Findik S, Sengul B, et al., Diffuse panbronchiolitis, a potentially misdiagnosed sinopulmonary syndrome, Ann Saudi Med, 2005;25:501–4. De Smet K, De Maeseneer M, Ilsen B, De Mey J, Diffuse panbronchiolitis in a 67-year-old Chinese man, Emerg Radiol, 2011;18:169–71. Hanon S, Verbanck S, Schuermans D, et al., Evidence of improved small airways function after azithromycin treatment in diffuse panbronchiolitis, Respiration, 2012;84:75–9. Diffuse panbronchiolitis in Latin America, Am J Med Sci, 2000;319:183–5. Souza R, Kairalla RA, Santos Ud Ude P, et al., Diffuse panbronchiolitis: an underdiagnosed disease? Study of 4 cases in Brazil, Rev Hosp Clin Fac Med Sao Paulo, 2002;57:167–74. Schulte W, Szrepka A, Bauer PC, et al., [Diffuse panbronchiolitis. A rare differential diagnosis of chronic obstructive lung disease], Dtsch Med Wochenschr, 1999;124:584–8. Breidert M, Janssen-Langenstein R, Hambrecht S, [A 63 year old Turkish woman with recurrent pneumonia], Internist (Berl), 2007;48:420–5. Chantarotorn S, Palwatwichai A, Vattanathum A, Tantamacharik D, Diffuse panbronchiolitis, the first case reports in Thailand, J Med Assoc Thai, 1999;82:833–8. Palwatwichai A, Chaoprasong C, Vattanathum A, et al., Clinical, laboratory findings and microbiologic characterization of bronchiectasis in Thai patients, Respirology, 2002;7:63–6. Sandrini A, Balter MS, Chapman KR, Diffuse panbronchiolitis in a Caucasian man in Canada, Can Respir J, 2003;10:449–51. McGrath EE, McLaughlin AM, Fitzgerald MX, Diffuse panbronchiolitis: East meets West, Eur Respir J, 2007;29:817–8. Zainudin BM, Roslina AM, Fadilah SA, et al., A report of the first three cases of diffuse panbronchiolitis in Malaysia, Med J Malaysia, 1996;51:136–40. Majoor CJ, Cox AL, Aliredjo RP, Dekhuijzen PN, [Diffuse panbronchiolitis in an Asian woman with severely obstructed pulmonary disease], Ned Tijdschr Geneeskd, 2006;150:1251–6. Lum D, Wong C, Anderson G, Taylor G, Test and teach. Number Fifty-three. A rare lung disease in an Indian man. Diagnosis: Diffuse panbronchiolitis, Pathology, 2007;39:594–7. Naalsund A, Foerster A, Aasebø U, et al., [An answer to an inquiry on diffuse panbronchiolitis. Now it has found its way here! ], Lakartidningen, 1995;92:3119–21. Carvalho L, Freitas S, [Vasculitis and diffuse panbronchiolitis-like in systemic lupus erythematosus--case report], Rev Port Pneumol, 2007;13:267–74. Poh SC, Wang YT, Wang WY, Diffuse panbronchiolitis--a case report, Singapore Med J, 2001;42:271–4. Adams NP, Congelton J, Diffuse panbronchiolitis, Eur Respir J, 2008;32:237–8. Sugiyama Y, Kudoh S, Maeda H, et al., Analysis of HLA antigens in patients with diffuse panbronchiolitis, Am Rev Respir Dis, 1990;141:1459–62. Poletti V, Casoni G, Chilosi M, Zompatori M, Diffuse panbronchiolitis, Eur Respir J, 2006;28:862–71. Izumi TA, Nation-wide survey of diffuse panbronchiolitis and the high incidence of diffuse panbronchiolitis seen in Japanese respiratory clinics, In: Grassi C, Rizzato G, Pozzi E (Eds) Sarcoidosis and other granulomatous disorders, New York, NY: Elsevier Science Publishers, 1988;753. Jaffe A, Bush A, Anti-inflammatory effects of macrolides in lung disease, Pediatr Pulmonol, 2001;31:464–73.